You all remember the story of the Michigan girl trying to meet her on-line love interest in Jericho, right? Prosecutors on Thursday agreed to withdraw a petition calling for court supervision for a 17-year-old who flew to the Middle East to be with a man she met on MySpace.com. The decision was part of an agreement reached between Katherine Lester, her parents and the Tuscola County prosecutor's office. She must surrender her passport, complete counseling and not leave the state without written consent from her parents or a court order. If Lester fails to comply with any of the terms, the prosecutor's office may reauthorize its runaway juvenile petition, under which a judge could place her under court supervision until she turns 18 next June 21. Lester left the courthouse in Caro without commenting to reporters. She was 16 when she developed a romance with a man 6,000 miles away, in the West Bank town of Jericho, through messages sent on MySpace. Lester is now living with her father, Terry, near Flint. In an interview last week on ABC's "Good Morning America," she declared her love for Abdullah Jimzawi, a 20-year-old Palestinian who works in his father's business delivering goods to minimarkets. She said she still wants to marry him. Jimzawi, in a recent interview with the AP, said he met Lester online about eight months ago and was devastated when he learned they would not meet face-to-face. Jimzawi's mother, Sana, said Lester intended to sign a marriage contract in Jericho. Terry Lester has declined requests from The Associated Press to interview his daughter but says her story should serve as a warning to families — not about the dangers of the Internet, but about the importance of good family communication. "She's her same old self," he said. "She knows what she did was wrong, and she's willing to accept the responsibility." You know what, why don't they just let her fulfill her dreams? After all, we Israelis keep being told that we should coexistence with the Palestinians. If it's good enough for us, why not for her? I just watched a video on the Fox News website n which former Israeli ambassador [actualy NY Consul] Alon Pinkus is interviewed. He is asked, "It's okay to go in and invade ... over a soldier, but not over a settler?" Alon's answer contains the following quote: "There seems to be a different attitude when it comes to freeing a soldier, than a settler ... should not have been where he was". I have replayed this many times and still can't believe what I heard. What is this supposed to mean? The context is defending Israeli citizens' right to live! Is this not implying a different standard for citizens on "the wrong side" of the '67 border? But let's leave aside the ideological debate for now. According to news reports, Eliyahu z"l was kidnapped after hitchhiking at French Hill - inside the city of Jerusalem! 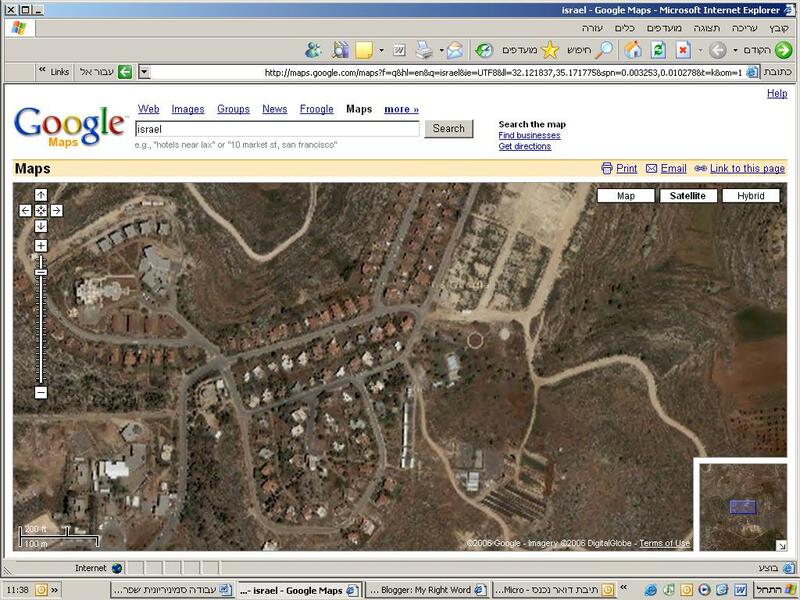 Is that any less legitimate a place for an Israeli to be than Gilad's manning a military post?! In the last Knesset elections, the Shinui party ran an election advert on TV which was subsequently heavily cencored by the Central Elections Committee Chariperson Supreme Court Judge Dorit Beinisch. (for Hebrew readers, see these stories: 1, 2). Well, Maariv newspaper reported yesterday (and I haven't been able to find any online references so you're just going to have to trust me, wait, maybe I can scan it) that the High Court of Justice, Aharon Barak as President, declared the clip "comparable to antisemtic propaganda" and rejected the Shinui party appeal. He further wrote, "the clip arouses in the eyes of the beholder difficult reminisces of millions of our brothers that were burnt alive in the Nazi crematoria". One of my daughters loves the Potter series, both in English and Hebrew. J. K. ROWLING has come close to saying that she will kill off Harry Potter, the boy magician who made her a multi-millionaire. The author said in a televised interview that both she and her daughter were having to resist pressure to reveal the plot of the last book, which will be published next year at the earliest. But she revealed that two principal characters would be sacrificed in the seventh and last book in the series. “The final chapter is hidden away, although it’s now changed very slightly,” she told Richard Madeley and Judy Finnigan. “One character got a reprieve. But I have to say two die that I didn’t intend to die . . . A price has to be paid. We are dealing with pure evil here. They don’t target extras, do they? They go for the main characters . . . well, I do.” Asked whether one of the casualties would be Harry himself, she said that she understood authors such as Agatha Christie killed off their main characters to prevent other writers from hijacking them. She added: “Agatha Christie did that with Poirot, didn’t she? She wanted to finish him off herself . . . I admire people who go out when people still want more.” She refused to elaborate yesterday because she didn’t “want the hatemail”. Invite your family & friends in the US and other countries to the one-year commemoration events for Gush Katif. Please forward their email addresses and we (Mattot Arim mattot.arim@gmail.com) will send them invitations to the events in their area. - Kindly indicate the country of residence. As you may know, the Committee of Gush Katif, encompassing members from all of the 21 dispersed communities in the Gush, has designated Tuesday, August 1, as a memorial day. Please consider planning an event in your community: whatever you decide would work best in your particular area. The Gush Katif C'tee is preparing education kits that will provide needed materials for the commemoration. These will be available in mid-July. The Gush Katif Committee will publicize all the activities that will be taking place for this world-wide day of remembrance. Please make YOUR event part of this large plan! Thank you!! Professors for a Strong Israel deplores the extreme procrastination that preceded the start of military action against the terrorists in the Gaza Strip. This delay served to increase their motivation and led to increased missile fire against Israeli towns and, ultimately, the recent incidents of kidnap and murder. We reject the folly of waiting for international "legitimacy" before acting to defend Israeli citizens exposed to terrorism. * We demand that Operation "Summer Rains" continue beyond the rescue of the kidnapped soldier. We demand that it continue beyond elimination of the threat of the Kassam missiles. Likewise, it is unacceptable that the ultimate goal of the operation be the surrender of the Land of Israel to the "good terrorist" Abu Mazen. We demand that this operation continue until the full and final expulsion of the Palestinian Terror Authority from the Land of Israel. The thing we are witnessing is a huge misdirection show, not a war or a battle - The mother of all deceit jobs ever devised. * They are setting up make belief precedent in preparation to actually destroy JEWISH TOWNS and PEOPLE. Does anyone actually believe that we are looking at an actual military delivery when after 3 days of "military" operations NO ONE HAS BEEN HURT...! They are armed to their teeth but shot no soldier and there are three HATIVOT now in Gaza at least plus tanks, aircraft - and NOT A ONE CASUALTY. -They can sell that to idiotic morons unable to think. JEWS MUST PREPARE TO FIGHT the attack against us being prepared and NOW! Since everything decided in Israel (a very small country with little support in the world) is in fact, practically speaking, decided jointly in Israel and in the United States, this rally at a key location in the United States is very important indeed. Harvey Tannenbaum (aka Protexia) has been hammering away for over two years on the misleading information we get regarding IDF activity. While we do see very good results, many times a lot of the shells fired are worthless. It's the "empty syndrome". Empty fields, empty lots, empty buildings. You'd think that there were empty heads in charge of this strategy. Terrorists just successfully fired 3 KASSAMS and hit the ASHKELON cemetery...longest range kassams are now skipping SDEROT and are after the dead Jews in the Ashkelon cemetery....as a 'trial run' against live Jews in Ashkelon? Just Exactly Who Should Restrain? Condoleeza Rice suggests Israel should show restraint. I mean we've seen her legs, her black jackboots, a possible reason she's not married, her playing the piano and now we have to watch her train? Scott Davis, Is This You? One Scott Davis has had his letter published in the New York Times today. Hamas knows full well "the reality of the world the Palestinians live in." The Palestinians are ruled by an occupying power, denied full rights in the occupier's country and in their own lands. Every meaningful facet of life for them is controlled by Israel. If our great country were invaded and occupied by the Soviets during the cold war, I highly doubt that the citizens of our great nation would not fight back. Homemade rockets versus missiles isn't a fair fight, but it's all the Palestinians have. Let's not forget that the West Bank and Gaza aren't nations. This is not one country attacking another. The French resisted the Nazis, the Algerians resisted the French, and the Jews who founded Israel resisted British occupation. Now, as we all know, the Jews resisted British occupation but they didn't blow up buses and restaurants with civilians inside; they didn't attack schools and kindergartens; they didn't kidnap teenage hitchhikers - and I could go on and on. Even the King David operation (btw, the Begin Center is conducting a two-day conference on the occasion of the 60th anniversary since the action) was directed at the hotel's southern wing which had, since 1938, been expropriated by the Mandate authority for use as an army command center as well as the offices of the Mandate bureacracy. So Scott Davis attempts a sleight-of-pen trick and compares occupation resistance of one kind to an evil other kind. I did a search and my educated guess is is that he is the author of this book, "The Road from Damascus, A Journey Through Syria" and that he's involved in "Bridge Between Cultures". And what is "Bridge Between Cultures"? Bridge between the Cultures is a response to confrontation between the United States and the Arab and Islamic world following the September 11th attacks. Bridge between the Cultures consists of a series of books published by Cune Press as well as a wide-ranging public education project. Bridge between the Cultures is a public education project sponsored by Cune Press and its partners. One of their books is Searching Jenin: Eyewitness Accounts of the Israeli Invasion 2002, Edited by Ramzy Baroud and Prefaced by Noam Chomsky. Chomsky? Yikes! A searing testament to Israeli brutality and Palestinian resilience, spirit, and grace under pressure. This book explains what happened and how it affected the residents. It includes forty-two testimonies of Jenin survivors gathered by Palestinian journalists. American policy toward Israel is unfair to Palestinians. If the situation were reversed, if Americans were living in Palestine, would they put up with the current situation? Would they be happy with events since 1948? Americans have little idea of the rough treatment that Israel has handed out to Palestinians, the constant stream of indignity and death. 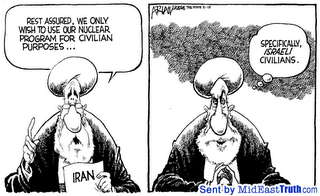 Americans do not realize that the Israeli “get-tough” policy, backed by the US, only empowers radicals on both sides. Americans think of Israel as a democracy. But most Americans have never stopped to think if there is a contradiction between the notion of a Jewish state and democracy. Is it fair that, say, a Samoan who converts to Judaism has the “right to return” to Israel, whereas a Palestinian whose family had lived in Palestine for 1,700 uninterrupted years until the 1948 war does not have this right? Davis was dismayed that in the entire country there was not a single press that published books sympathetic to Arab and Islamic culture (although one or two very small presses did publish political books). Davis also was dismayed at the conglomeratization of US book publishing—a trend that puts thoughtful authors and talented editors on the street in favor of commercial writing, much of it rubbish. Davis noted that the two problems were related. The extreme commercial emphasis of book publishing narrowed the subjects that were considered possible for books if they were to reach their earnings goals. Formula books and name authors blocked the channels that, in previous years, might have allowed unusual subjects and new authors to win a following. Here's Scott Davis' e-mail address in case you want to ask him if he is indeed the Scott Davis who wrote the letter or that I'm mistaken. 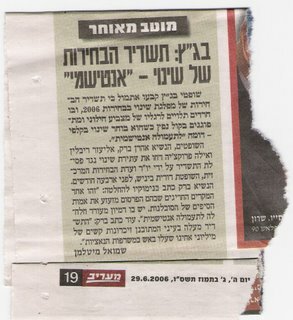 Yaakov Ahimeir, news presenter for IBA Channel One TV, has an op-ed in today's Maariv newspaper. Why was it that after months of terror activity, hundreds of Kassams and a general deterioration of security, it was only the abduction of one soldier that set off this "Summer Rains" operation in Gaza? And why are the IDF cannons continuing to fire into "launch areas" rather than better targets? Why was the extreme injury perpetrated against thousands of civilians in Sderot and Ashkelon as well as 45 rural and agricultural communities surrounding Gaza insignificant enough for a military response and yet just one soldier kidnapped set all this off? Why has the media launched into an attack on the late Eliyahu Asheri, blaming him for hitchhiking and the rest of Yesha's youth for continuing to do so but after just a few reports on the amazing ineptitude of the soldiers' performance and that of the IDF afterwards, all the criticism has died down? Something is rotten in our political and military establishments. It should be noted that the murder was consistent with the "Prisoner's Document" agreed to by "man of peace" Mahmoud Abbas. Kafkafim is the Hebrew term for foot apparel that is called flip-flops in Hollywood. The suicide of Meirav Kanner, known online as Rapunzel, continues to resound through the Israeli blogosphere. Following her death on June 17, there have been calls to define the limits of online discourse in order to minimize harm to the people behind the blogs. Kanner, who wrote that she had emotional problems as a result of physical abuse suffered as a child, revealed her plight for the first time in 2004 in posts accusing her father of the abuse. She was interviewed by various mass media outlets and began a blog, in which she told her story through her political struggle as a feminist and an emotionally troubled woman. Over the past two years she received warm and sympathetic responses ? as well as hurtful and disparaging ones. Kanner herself did not respond only to the gentler comments, and often conducted stinging verbal fights with surfers. In the last few weeks of her life, Kanner's emotional state apparently deteriorated, and she hurled harsh accusations at various people, even mentioning their names on her blog. Yariv Habot, the founder and operator of Israelblog, felt compelled to remove her blog from the Internet to avoid the risk of a lawsuit. .
Kanner responded by launching an independent blog with the help of Internet columnist and blogger Hanan Cohen. Kanner declared a hunger strike and continued her verbal assault. After her death, and at her request, Cohen deleted her blog and had it removed from Google's archives. A few days later, however, Kanner's partner restored her blog's archives to the Internet. More than 750 Israeli websites hacked in recent hours. Among them: Soldier’s Treasury Bank, Rambam Hospital, and Globus Group ticket center. Hackers: You’re killing Palestinians, we’re killing servers. Unprecedented number of Israeli websites hacked: Hundreds of websites were damaged by hackers in recent hours, following IDF activity in the Gaza Strip. The hackers are members of the Moroccan “Team Evil” group, responsible for most of the website damage in Israel in the past year. This is the largest, most concentrated attack on Israeli websites in recent years. Wasting time sitting in front any screen - computer, video game, TV. "He missed his deadline because he spent the afternoon screensucking." I found this artwork here and imagined that it could symbolize how I view left-wing anti-Zionism. You know, the trendy "radical-chic" type. I don't know if it's Rav Goren's special prayer for victory in battle or just Tefillat HaDerech or a few Tehillim. But IDF soldiers do pray. To see why, we need to consider another factor—namely, the distinctively American inclination toward congregationalism, individualism, and unfettered experimentation in religion. All of these serve to promote variety rather than uniformity, clearly lending creativity and vitality to the American religious scene—but no less clearly leading to fragmentation. The same holds true for American Judaism in all of its denominations, except perhaps for the Orthodox. Nowhere else in the world are the Conservative, Reform, and Reconstructionist branches so powerful and energetic as they are here. But this vitality, which has succeeded in attracting about three-quarters of all synagogue-affiliated Jews, has arguably also contributed to detaching them from their coreligionists elsewhere, and especially in Israel, where versions of Orthodoxy dominate and shape the received idea of Judaism held even by those who do not attend synagogue or adhere to Jewish religious practice. Does any of this matter? What exactly is lost by a redefinition of Jewry in terms of individuals rather than in terms of a single people, and of Judaism in terms of personal and private identity? Our own answer is unabashedly “essentialist”: seeing Jews as a global extended family, exhibiting concern on these grounds for one’s fellow Jews, are authentic expressions of what, from biblical times forward, it has meant to be Jewish, and to act responsibly for the sake of the Jewish future. Jews are not solely the agglomeration of adherents of a particular faith, each seeking personal meaning; they are a people whose primary mark has been the conviction of a uniquely corporate role in history—the mark, to use classical theological language, of chosenness. To retreat from peoplehood is to repudiate what has been at the core. John Updike has a new novel out. About terrorism. But there has to be a Jew involved, right? Here are excerpts on that aspect from a review by Jonathan Raban published here. In Terrorist, John Updike has built a marvelously seedy cityscape in which to lodge his fictional jihadists. New Prospect, New Jersey (which shares much the same geographical coordinates as Paterson) was in its heyday in the nineteenth century as a mill town: since then, it has fallen into lax decrepitude. Ahmad Mulloy is a not untypical product of the New Prospect melting pot: the son of an Egyptian father who decamped when he was three, he has been brought up by his lapsed-Catholic Irish-American mother, who is a nurse, a cigarette smoker, and the painter of the gaudy abstracts that decorate the thin walls of their scruffy rented apartment. ...A few pages earlier, Levy, glooming over the unlovely dawn view of his hometown, has remarked to his wife, "This whole neighborhood could do with a good bomb." Long before Ahmad himself knows his fate, the reader is aware that, by the end of the book, he's going to be at the wheel of a truck bomb. ...From the start, Ahmad mouths Islamist stock-in-trade generalities: Washington, D.C., is run by scheming Jews; the Kuffar (unbelievers) who surround him at his school are "devils," "unclean," "slaves to images"; those who are Christians worship a dead god; America is doing evil things in the Middle East. ...At one point Shaikh Rashid asks him, "Did you not discover that the world, in its American portion, emits a stench of waste and greed, of sensuality and futility, of the despair and lassitude that come with ignorance of the inspired wisdom of the Prophet?" To which Ahmad replies, "This isn't the fanciest part of the planet, I guess, and it has its share of losers, but I enjoyed being out in it, really. People are pretty nice, mostly." Moments later, he agrees to drive the suicide truck. "I will die...if it is the will of God." ...Nowhere is Ahmad, or the reader, exposed to the kind of intense political rage that has spurred terrorist attacks in the real world. The plotters go about their business as unemotionally as if they were planning a bank heist—but bank heists have an obvious motive, while the bomb in the Lincoln Tunnel appears to be motivated by little more than vague disgruntlement with the American way of life and, in Ahmad's case, a willingness to go against the grain of his own character in order to please his masters and give satisfaction to a god in whom he insecurely believes. ...If Ahmad's foreordained path toward the Lincoln Tunnel provides the strong narrative spine of the book, much of the flesh is supplied by scenes, reminiscent of the encounters between Dale Kohler and Roger Lambert in Roger's Version, that pit Ahmad's naive credulity against the world-weary skepticism of his high school counselor, Jack Levy. These exchanges are oddly written, more in the style of formal Socratic dialogues than the realistic speech of a conventional novel. In them, Faith speaks to Doubt, Doubt back to Faith, and their stiltedness is perhaps part of their essential point, as if Updike were summoning the language of Pilgrim's Progress or a medieval morality play. Jack Levy's sole remaining task is to die and thus contribute a little space, a little breathing room, to this overburdened planet. The task hangs in the air just above his insomniac face like a cobweb with a motionless spider in the center. So Levy faces the atheist's oblivion, Ahmad the sensual paradise of the Islamist martyr. Yet Levy, decent teacher that he is, is firmly on the side of life, for his students if not himself. Thus conjoined by fate with Ahmad (and also, for this is an Updike novel, with Ahmad's forty-something mother, Terry, via her "perfect, gorgeous XXXX"), Levy is destined to share the ride to the tunnel so that there can be a protracted wordy showdown between bluff school counseling and deluded juvenile religious belief. But an inordinate amount of novelistic hard labor is required to get the pair together in the truck, en route for the big bang that will open the tunnel to the Hudson River....It just so happens that the considerable city of New Prospect has a single entry ramp onto Interstate 80, so that Jack Levy can intercept the truck bomb when it is conveniently stopped at a red light (and, astonishingly, ever-polite Ahmad will open the passenger door and let him in). Again and again, one's made aware of the novelist forcing the characters and the world around them to conform to his will. In a novel suffused with fear of religious totalitarianism, it's unnerving to find Updike himself playing the role of a tyrannical god. Levy says, "I can't believe you're seriously intending to kill hundreds of innocent people." "Who says unbelief is innocent? Unbelievers say that. God says, in the Qur'an, Be ruthless to unbelievers. Burn them, crush them, because they have forgotten God. They think to be themselves is sufficient. They love this present life more than the next." "So kill them now. That seems pretty severe." "It would to you, of course. You are a lapsed Jew, I believe. You believe nothing. In the third sura of the Qur'an it says that not all the gold in the world can ransom those who once believed and now disbelieve, and that God will never accept their repentance." Mr. Levy sighs. Ahmad can hear moisture, little droplets of fear, rattle in his breath. "Yeah, well, there's a lot of repulsive and ridiculous stuff in the Torah, too....The priests try to control people through fear...."
We Jews just can't win. Either we're the cause of terorism or we contribute to it or we are too dumb to stop it. That's a WASP for you. First, we attempted to illustrate during the "disengagement" what Israel's coast near Ashkelon looks like from Northern Samaria at night. 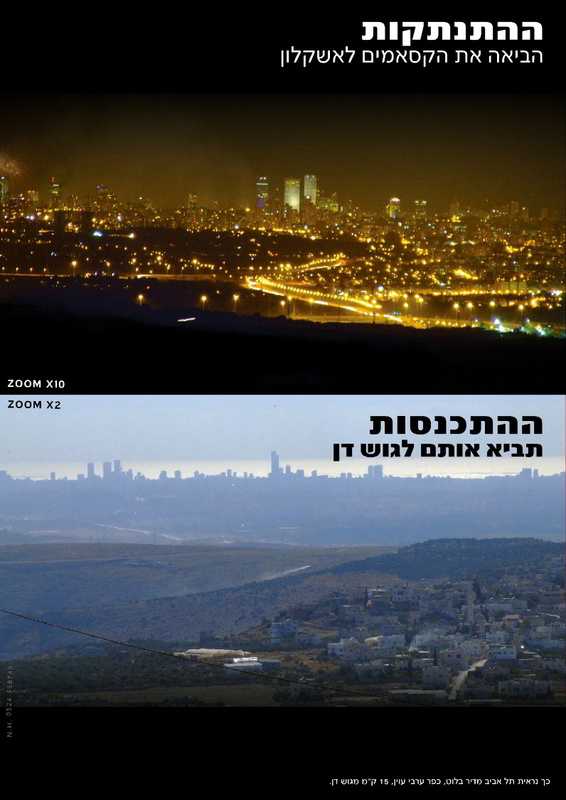 Now someone has improved the view to daytime looking out from Deir Balout, near Bet Aryeh on the way to the airport. Unfortunately, the Arabs seem to be improving all the time while Israel's "realignment gang" is retroing Israel back to the Mandate period. The bombardment of the Western Negev that holds the population and the economy of southern Israel hostage to the whims of jihadist cells with rocket launchers has shown up another major myth that forms the basis of Olmert's world view. Olmert and his associates claim that the IDF deployment in Gaza was wasteful because all those forces were being used just to defend those annoying, fanatical settlers in Gush Katif and northern Gaza. But as the bombardment and the IDF's inability to stop the bombardment from outside Gaza shows, the IDF was not in Gaza to protect the Israelis who lived there. The IDF was in Gaza to protect Israel. Any major IDF offensive in Gaza would constitute an admission of this truth. Yet since the government's only policy is to reenact last summer's retreat in Judea and Samaria, it cannot acknowledge this truth. It needs the public to believe that the safety of Tel Aviv and Jerusalem can be guaranteed by having IDF forces sitting in Tel Aviv and Jerusalem. It needs the public to believe that settlers are the cause of their misfortunes and not the jihadists who are waging war against our country. That is, they need the public to believe that empowering terrorists doesn't empower terrorists. FINALLY, OLMERT cannot allow a counter-terror offensive in Gaza because doing so will lead to international condemnation of Israel. It isn't the impact of the condemnation Israel's international standing that concerns him. Olmert cannot be condemned internationally because he promised that after Israel retreated from Gaza, the international community would accept any Israeli counter-terror offensives in Gaza. Sunday's attack and Cpl. Shalit's kidnapping are watershed events. In the coming days and weeks, it will become self-evident to the Israeli public as a whole just how indefensible Olmert's plan to empower terrorists actually is. Yet public recognition of his plan's failure is not enough. In 2000, the public realized that Barak's terrorist empowering peace plan had brought us war. Yet rather than discard the policy of empowering terrorists, our political leaders simply repackaged it. What had formerly been called "peace" was called "separation" and "disengagement" and now is called "convergence" or "realignment." These euphemisms are sold to the public in turn as new quick-fixes that spare us the need to recognize the reality of war. And you've read it all here over the past two years. The demand for Shalit's return to his home, his parents and to the IDF must be sharp and explicit. There must be no room left for "interpretation" or compromise. The abduction of Gilad Shalit, as well as the deaths of two comrades is not an isolated incident. Rather, it is the product of a long process, during which Israel has lost its power of deterrence against the Palestinian enemy. The new government's so-called "policy of restraint" has been interpreted as weakness – and Israel cannot afford to appear weak. Last Sunday I visited Sderot, an Israeli city well within the Green Line. In the 10 months since disengagement, Sderot and other Negev towns have suffered approximately 600 Qassam Rocket attacks. I met mothers who send their children to nursery schools and kindergartens with fear in their hearts, who harbor only one prayer for the rest of the day: "Please, let them come home safely." The power of deterrence is a vital asset for Israel as we are engaged in a battle for our existence. Defense Minister Peretz, himself a resident of Sderot, promised there less than a week ago that "within 10 hours there will be a substantial improvement in the security situation." The deadline passed – but nothing. Empty statements are not sufficient to create deterrence. The key is our faith and our responsibility not to accept rocket attacks on our women and children. The murderous enemy must understand that we will not agree to sit as sitting ducks. The time has long passed for Israel to use its power against those who murder our people and hide behind their civilians. Deterrence requires faith: Faith in ourselves and in our power – and making the enemy internalize the fact that we mean what we say. 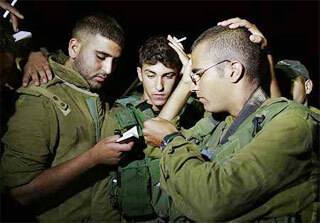 Strong deterrence is also the real key to the swift, healthy return of Gilad Shalit. Therefore, we in the Likud propose setting past differences aside. We expect the government to "drop the (figurative) gloves", and to allow IDF officers and fighters to work to restore Israel's power of deterrence. This is the only way the government can start to begin to correct the mistakes of the past, and can prevent them in the future. Should the government adopt such a policy to restore Israel's deterrence, the government will enjoy the full support of the Likud, and of the majority of the nation as well. I found this fascinating and helpful but cracked up as the author's name is Uzzi Ornan (son of Yonatan Ratosh, the famous Cannanite, and former Irgunist). The JPost got it backwards. Anyone who lives in Israel or has visited knows that many, perhaps most, road signs are written in both Hebrew and English (and often in Arabic as well). The English signs - meaning those written in Latin characters - are not translations of the Hebrew, but transliterations. Those who don't read Hebrew can't easily figure out how to pronounce place names simply by reading the Latin transliterations. It's not easy to guess the proper pronunciation of any foreign language. But signs of this sort are not intended for foreign tourists alone. Hundreds of thousands of Israelis look at signposts and see the Latin characters first, even if many of them know some Hebrew. Some of them are newcomers, others veteran immigrants who came as adults and haven't perfected their Hebrew. Others are foreign workers or members of the diplomatic corps. For some, Latin transliterations offer a "moment of Hebrew" which helps non-Hebrew readers make some connection between the Hebrew and English alphabet. This is a strong reason why the Latin characters of Hebrew words should be accurately written and clearly represent the Hebrew original. For example, Hebrew has two letters for the "K" sound. Certain words need to be transliterated with a "K" and others "Q," - for instance, "Ksalon," but not "Qoranit." Latin characters that do not identify an individual Hebrew phoneme - that is, a unit of a sound in a language - with a unique transliterated letter do not help non-Hebrew readers, and are actually confusing to those who have some command of Hebrew. THE ACADEMY for the Hebrew Language, of which I am a member, is now addressing the problem of Latin transliterations of Hebrew signpost names. We've been under a great deal of pressure to introduce a standard for converting Hebrew words into English. This pressure comes from those involved with tourism and transportation. I believe the way to proceed is to convert each Hebrew phoneme into a separate and different Latin letter. Hebrew speakers know the difference between ayin and aleph in writing, even though many people pronounce them identically. For a tourist the difference may be insignificant, but Israelis know the distinction is essential. Similarly, in preparing a conversion of a Hebrew phoneme into separate Latin letters, the academy should separate between tav and tet. They obviously should be converted into a distinct Latin letter. Tet should be written with a dot under it, while tav should be a simple "t."
The main feature that the Standards Institution of Israel and its Conversion of Scripts office demands is that it be possible to automatically reconstruct a converted text into the original script. That is the criterion we should uphold for our signposts. Another principle for transliteration into Latin is that each Hebrew phoneme be converted into only one letter, not a combination of letters. The solution - as with most European languages transliterated into English - lies in employing a diacritical or accent mark such as small line under a letter, or small "v" above a letter. There is a third point. "G" and "c" in English and many other languages have each two pronunciations. Still, both are represented by the same letter. Hebrew also has letters that have each two pronunciations. They are "bet", "pay", and "kaph" which sometimes have the phonetic value of "v," "f" and the Spanish "x," respectively. Hebrew speakers know how to pronounce them properly. They are essential to Hebrew writing. But for signposts I suggest that a small line be added under the letter to show the intended pronunciation. In the final analysis, no nation should distort the elements of its language just for the sake of making life easier for tourists. Greater issues are at stake. We have every reason to expect that no tourist will get lost if the formulation I advocate for transliterations is adopted. The writer is a full member of the Academy for the Hebrew Language, a professor emeritus at the Hebrew University of Jerusalem and visiting professor at the Faculty of Computer Science at the Technion. Steve Erlanger reviewed a book on the Hamas. Steve is a NYTimes correspondent based in Israel. Making good use of Treasury and F.B.I. analyses of Hamas and its fund-raising efforts in the United States and abroad, Levitt says he wants to destroy "the myth" that Hamas has separate military and political wings. He notes, as do Hamas leaders themselves, that there is one Hamas, and that it has a single leadership. Further, Levitt asserts that Hamas's charitable work — including clinics, hospitals and religious centers — is intended to recruit new soldiers to its jihad, or holy war, against Israel, which it steadfastly refuses to recognize. He calls Hamas-sponsored mosques, schools, orphanages and sports leagues "integral parts of an overarching apparatus of terror." What Levitt does not much discuss, however, is that the Muslim Brotherhood was founded in Egypt primarily to Islamicize the societies in which it worked, and that Hamas's essential goal remains the creation of an Islamic society in Palestine. The war against Israel is actually secondary. Yes, but the Islamicization of Palestinian society negates the existence of Israel. Most damaging of all, Levitt does not discuss (and never even seems to entertain) the premise that Palestinians have a right to resist a 40-year Israeli occupation and partial annexation of their land. Part of Hamas's popularity among Palestinians stems from its commitment to the resistance. 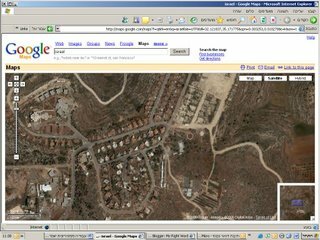 The Jewish settlements on the West Bank, the separation barrier the government is constructing, restrictions on movement by Palestinians, the failure of the Israelis to support those in Fatah committed to nonviolence, like President Mahmoud Abbas, do not enter Levitt's analytical universe. Imagine that. Levitt, the author, doesn't entertain the idea/premise/assumption that the Pals. have a right to a country which isn't there's, wasn't there's and was intended by an international body, the Supreme Council of the League of Nations in 1922, to be the Jewish national homeland. 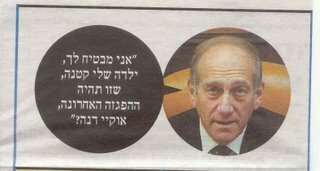 Ben Dror Yemini, the Deputy editor of Maariv, published the following column this past Friday in the weekend edition of the paper, June 23, 2006 relating to the free speech trial of Professor Steve Plaut. "Anyone today who 'dares' to recheck the events of the Holocaust and its scale, from any point of view, whether it be human, historic, scientific, political, or otherwise, immediately is turned into the target for attacks and accusations of being an anti-Semite and Holocaust Denier, worthy of being dubbed Judenrat or a Jew for Hitler. "This phenomenon becomes buttressed even more when factual statistics, data, or opinions and theories about the Holocaust are presented that differ from the statistics about the Holocaust published to date or that deviate from the known consensus. "This phenomenon is in opposition to the principles of democracy, which are supposed to stand firm especially in those cases where stormy public debate arises about such sensitive and painful subjects." That sums up, albeit in a somewhat palliated manner, the position of the President of Iran, Ahmed Ahmadinejad, about to hold an assembly of Holocaust Deniers in Teheran. He is, as is well known, a stout defender of academic freedom of expression. Therefore groups of Holocaust Deniers, who "deviate from the known consensus", together with some others, will be assembling in Iran, and the 'truth' of the Holocaust Deniers will be published for all to see. filthy laundry, to make a determination. And lest we err, the woman judge adds for us that she is simply not aware that David Irving himself is a Holocaust Denier. She does not know that Irving was judged in Britain and was declared a Holocaust Denier and a liar. She does not know that this same Irving is now sitting in prison in Vienna for Holocaust Denial. This woman judge is traveling down the familiar path of phony "rights discourse". This is where automatic judgment is always relativistic, where it denies there is any reality at all, only "theories". Actually, most liberal freedoms are misused by fringe elements. In the USA, these include the Neo-Nazis marching through neighborhoods of Holocaust survivors in Skokie, and in Israel they include Kahanists who want to march through Umm al-Fahm, as well as extremist fanatics like Azmi Bishara who endorse "resistance" . meaning terror. All this in the name of freedom of expression. Elie Weisel was interviewed in Newsweek magazine. 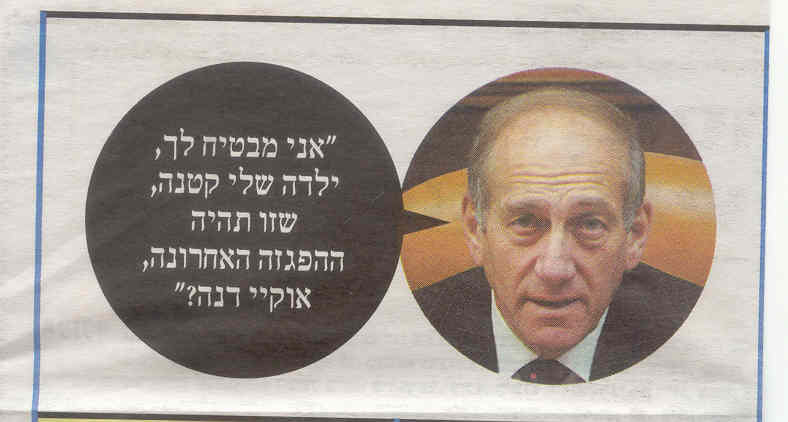 My impression is that Olmert will go far. He'll follow Sharon's footsteps, this man who was so hated. In Europe, they carried banners, sharon=hitler. Yet all of a sudden he opposed his own party, his ideology and tried to do what is best. And was felled by a stroke. If God exists, he works in mysterious ways. Unfair ways. Yet great generals occasionally become messengers of peace. So who came to Petra? Among others, [Israeli Prime Minister] Ehud Olmert and [Palestinian Authority President] Mahmoud Abbas. Not one on one, but in conversation with other laureates and later at a breakfast hosted by King Abdullah. Very intimate; only eight people. Abbas arrived first, then Olmert. I feared some embarrassment, but no. Their handshake turned into a hug. The ice was broken! We spoke mainly of economies at first, Israel's and Palestine's, then it was all World Cup. The whole table could only talk soccer. Except me. I finally said, "Listen, this is all very nice but a decision must be made now for a second meeting." And it was accepted! Olmert later announced they would meet again in a few weeks for formal talks. This is addressed to the ordinary Americans among us, to all you schlemiels and schlimazels, nebbishes, nudniks, klutzes, putzes, schlubs, schmos, as well as schmucks, nogoodniks, and momzers, and I might add any golems and dybbuks that happen to be lurking out there in the crowd. I just wanted to say that like you, I get mamish sentimental when I think about English and its place in our society. To tell the truth, it makes me so verklempt I'm fit to plotz. That's why this whole schmeer gets me so broiges when I hear these mavens and luftmenschen kvetching about it as our national language. What chutzpah! These schmegeges can schlep their schlock about the cultural and linguistic diversity of our country and of English itself, but I for one am not buying their shtick. It's all so much dreck, as far as I'm concerned. I exhort you all to be Mensches about this and stand up to their fardrayt arguments and meshugganah farschtrunken assertions. It wouldn't be kosher to do anything else. Remember, when all is said and done, we have English and they have bubkes. I'm looking for sources on men and bleaching hair. I was told once that there's a halakhic distinction between hair dye, which adds color and is assur mishum beged isha, and bleach, which removes color, and is mutar. Are there any ratifying or contradictory pesaqim out there that can be referenced? OrthoMom has attacked, justifiably so, Tefilat haderech "Insurance". DovBear attacks almost everything but especially blonde shiksas who are conservatives. So, I figure, why not me attack hair-bleaching for men? I mean, how wrong can I be? Anyone with information is asked to contact one of four investigators: Lakewood Township Police Lt. Joseph Isnardi at (732) 363-0200 ext. 5332; Capt. Michael Mohel or Sgt. Vincent Frulio of the Ocean County Prosecutor's Office at (732) 929-2027; or Supervising Special Agent Dan McKenna of the Federal Bureau of Investigations at (732) 741-0006. Shouldn't there be a female policeperson involved in this? What is your general response to his remarks? My view is that if the chief executive officer of the Presidents’ Conference, which represents all of American Jewry, is expressing a public view that he wants Israel to extend from Cairo to Damascus, that individual should resign. It’s an extreme view, it does not represent the opinion of the American Jewish community and is so far outside the mainstream, that it calls into doubt that individual’s ability to represent the community that he serves. Hmmm. But isn't that how the far-left wing Zionists began in the U.S.? People even like Yoffie? P.S. I know Malcolm for, gee, about 40 years now, since early SSSJ days and I would support the view that he was being futuristic, if not downright Messianic, and not current political. Abu Arabid's camera shoots the removal of the dead and wounded, near where the three bodies had lain earlier. He focuses on a young girl with black hair wearing sweatpants: Huda, who takes a few steps and then starts running while calling for her father. She throws herself on the ground and the camera shows the body of her father. She cries out for him and hits herself. The camera pans to a pot filled with food and then returns to Huda. A young man tell her her father is okay although he knows the man is already dead. Huda, in wet clothing, sand stuck to her pants, pleads with the paramedics: "Take him to the hospital, he's alive." Abu Arabid photographs the body parts being collected into bags, plastic beach toys strewn on the sand, an Israeli Navy ship off the coast. "No one can remain indifferent to the pictures, the pain of the children," Abu Arabid says. "I looked at the tape afterward and broke into tears, how can one not?" The German newspaper Suddeutsche Zeitung cast doubt on the authenticity of the picture and made its own determinations without checking the facts: Why were bodies covered with sheets?, it asked - although they were not. Why were Huda's clothes dry? - although they were actually wet. Mohammed Salman, Abu Arabid's boss, is considering a suit against the German paper. "If a foreign photographer had taken the pictures, no one would have had doubts. Because we are Palestinian journalists they immediately claimed we staged it," Salman said, adding, "How can one stage such horror?" Prime Minister Olmert's Media Adviser Asaf Shariv will coordinate the media and the information campaign regarding both Cpl. Shalit's abduction and actions designed to bring about his release (the Prime Minister's Office, the Foreign Ministry, the Defense Ministry, the IDF and the security services). I guess then Gnissin is really out. blahger: A blogger whose message primarily consists of blah-blah-blah. To see the full Buzzword Compliant Dictionary, just click here. I read this and recalled words my late father told me and which I told my two sons. The gunmen launched their attack at approximately 5:00 A.M. Eight militants infiltrated Israeli territory via a tunnel adjacent to the Kerem Shalom commercial crossing. Upon emerging from the tunnel, the gunmen split up into three units, two of which blew up an unmanned armored personnel carrier which was entrenched in the ground. My father served in a combat unit in the South Pacific in the framework of the Army Air Force. He spent two years in the island jungles but not in the front lines. But he always told me that while on guard duty, a good soldier would try to figure out how the enemy is looking at you. What is the enemy observing. And how would I, if I was that enemy, attack the post I am defending. I think you get the drift of the advice. I imparted that to my two sons, both of whom served in combat units, in elite units, who actually fought and killed the enemy. If you are in such a situation, go outside your body, look at the way you act from the other's point of view and be ready. Here's a balance to that book review. Some people think that nationalism is a good thing (I do). ...Nationalism, of course, has long been a dirty word. It is generally deemed to have consigned Europe to almost continuous war between the early 19th century and the mid-20th century. And so it did. But as with so many attempts to extirpate evil, the desire to crush its baleful consequences overreached. It was not just nationalism, but patriotism that was suppressed. The idea that your country can stand for something benign became unsayable, even with nations whose past fully entitled them to make such a claim. The conviction took hold, in the governing and opinion-forming classes in the West, that the nation state itself was somehow an abomination, an intrinsic threat to peace and stability. So for half a century, emboldened political leaders in Europe made larger and larger efforts to snuff it out. But while you can submerge nationhood in a tight web of supranational institutions, you can’t destroy the basic allegiances that animate the hearts of men. You can take the soul out of a country but you can’t take a country out of the soul. And the risk has always been that the more you attempt to suppress the idea of a nation, the more you will foster resentment and the very sort of indignant nationalism that has proved so tragically costly. The European Union, of course, is not alone. The post-Second World War multilateral settlements designed to promote international co-operation between sovereign nations have become, in the dreams of many, an even larger opportunity to suppress the nation itself. There are political and cultural elites everywhere who regard the nation state as an unhealthy anachronism, who want to bury national pride and identity beneath an avalanche of deracinated, brotherhood-of-man, why-can’t-we-all-just-get-along-together mush. It is a conviction founded on a moral relativism, of course — no one nation is any better than any other — and promulgated by diplomats, business leaders and entertainers who have long since shaken off the irritating shackles of their own nationhood to play on a much larger global stage. To these people the United Nations is the highest achievement of humanity, and they would happily subjugate the will of peoples everywhere to its rule. But the principle remains that voluntary loyalty to one’s own group is the most powerful popular coagulant. Belief in the supremacy of national sovereignty is not at all, as its critics claim, an inevitable driver of racism or nationalism. Even if, like the Dixie Chicks, you claim not to be able to understand the very idea of patriotism, you should at least acknowledge that, for most people, the nation is the primary political unit, the one that legitimises the governing of their nation. I know that some people just can't stand to read or listen to Zionism's detractors and critics, as well as the pro-Pals. Okay, I'm different. Somehow, I seem to learn something from every article I read, no matter how unfair, misconstrued and mendacious. If you find yourself in agreement with me, fine. If not, skip to another blog entry of mine. I try to balance. Here then is a book review that, despite it all, has some lessons on how not to do Hasbara. What is it like to live as a foreigner in a land of suicide bombers and road blocks, of tensions sometimes verging on hysteria and communities consuming themselves with mutual fears and hatreds? Not much fun, unsurprisingly. Emma Williams is a British doctor who in 2000 went to live in Israel with her husband Andrew, a United Nations official, and three young children. This book is her account of their lives there through the three years that followed — the times of Arafat’s intifada, Sharon’s power, Arab atrocities and savage Israeli retaliation. What Israelis want understood is that, while “Arabs have many countries, Jews have only one”; that, in the face of Palestinian terrorism, the security of Israel makes ruthless measures essential; that the longer the Palestinians remain intransigent, the more just it seems to punish them, by confiscating each year a little more of their lands and livelihoods. Yet terrorism is the weapon of choice for the weak, fighting the strong. Williams, who formed close friendships among Palestinians, chronicles the humiliations and cruelties to which they are subjected, the frustration of daily life in which communities are shelled, bulldozed, road-blocked, or merely denied freedom to travel to their own homes or jobs, all in the name of Israeli security. The sick often cannot travel to hospitals, nor husbands reach their wives, nor children get to schools. Fear was a constant throughout the author’s time in Israel: of Palestinian suicide bombers, of the Israeli army. She believed that she had shielded her young family from comprehension of much that happened around them. Then one day at an Israeli checkpoint, after an altercation with a soldier, she returned to her car and found the children sobbing. Her eight-year-old said: “We thought — we thought the soldiers were going to shoot you.” A suicide bomber, it emerged, had blown himself up next to her children’s school. His head had landed in the playground. Williams is an excellent recorder of dialogue on both sides of the political divide. Her purpose is to illuminate the plight of each community. Yet pity for the Palestinians predominates [my emphasis - YM]. Whatever excuses and explanations Israelis offer, she says, nothing alters the fundamental fact that they have subjected the inhabitants of the West Bank to illegal military occupation for almost 40 years, and still dominate Gaza even though they notionally evacuated it last year. Each month, despite the state of the “road map” or “peace process”, Israeli settlements continue to rise in the West Bank, and the consolidation of Jerusalem and its suburbs into Israel advances. Sometimes, Israeli governments talk of abandoning some settlements in return for an end of terrorism, yet the great Security Wall between the two peoples is being constructed on a line determined solely by Israel’s convenience, heedless of Palestinian orchards or homes in its path. The Palestinians have been as much betrayed by their own leaders as by their foreign oppressors. Williams quotes an American UN official, musing on years and billions of international aid to the Palestinian Authority. At the end of it all, “what have the Palestinians got? Egyptian standards of bureaucracy, Syrian standards of human rights, Lebanese standards of accountability — and all to serve the interests of the Israelis”. This last proposition seems indisputable to most outsiders, including Williams. Yet Sharon’s response to the intifada was systematically to destroy everything that passed for economic activity in the West Bank, so that today terrorism is the Palestinians’ only viable industry. Most of Sharon’s people still believe that their own interests are best protected by keeping the Palestinians weak, poor and divided, not least by Israeli strategic roads and fortified settlements. No proposal anywhere near the negotiating table would offer the Palestinians a viable society, nor return to them most of the land taken by Israel since 1967. Williams argues that the Israelis’ obsession with “security, security, security” blinds them to the concessions that are indispensable, to provide a glimmer of a hope of peace. For the Palestinians, she says (explaining her title), suicide bombing represents a rational alternative to the misery of their daily lives. “As long as it remains easier to reach heaven than the end of the street — or the field, or school or hospital or the next-door village, let alone Jerusalem, the City of God,” she writes, “then no security measure yet devised will stop people seeking a gruesome short cut to end their hell on earth.” Williams’ angry chronicle makes grim reading, but it is all true. Checkpoints were a constant feature of Williams’s time in Israel. Pregnant with her fourth child, she had to abandon her car on her due date to get to hospital, and then watched as a Palestinian woman ahead in the queue, as heavily pregnant as her, was turned back. Asked why, the soldier at the checkpoint replied, “How do I know she’s pregnant . . . Everone’s fat round here.” Williams was waved through. While the PA and its benefiting classes are fighting a battle to keep the "process" alive, the Israelis have shown every indication that the "process" ended for them a long time ago. For them, the Oslo process was a necessary but historically finite step designed to co-opt the Palestinian leadership, solidify Israel's grip on stolen Palestinian lands, and normalise Israel's diplomatic status in the Arab world as well as globally. As the Israelis have achieved all these goals, the process no longer serves any purpose for them. At the moment, their continuing campaign to bomb and assassinate Palestinian civilians and pro- and anti-"process" politicians in the West Bank and Gaza has shown no sign of abating. As the Oslo process has brought calamity after calamity on the Palestinian people, its only reason for continuing is the survival of the PA classes that are its main and only beneficiaries. That's right, its's almost 2 AM but I could not let this go. GOC Central Command Yair Naveh issued orders last week restricting the movement of 13 far-right activists. The activists are suspected of taking part in violent acts against Palestinians and clashes with security forces. The issuance of the orders is also linked to the defense establishment's preparations for the evacuation of four extremist outposts in the West Bank. Naveh signed the orders following the recommendation of Defense Minister Amir Peretz and with the approval of Peretz and IDF Chief of Staff Lieutenant General Dan Halutz. Two types of orders were issued. One restricts the movement of West Bank residents, barring them from reaching other areas in the West Bank, particularly outposts slated for evacuation. The other is aimed at far-right extremists who reside within the Green Line border, barring their entry into the West Bank. The orders will be given to the activists in the coming days, and will be valid for a period ranging from three months to one year. The list of activists was determined based on recommendations by the Shin Bet security service's Jewish Division and the Judea and Samaria Police Department. The Israel Defense Forces and Shin Bet refused to disclose the names of the extremists, claiming that publicizing the names would interfere with proper distribution of the orders. Madonna seems to have found a new protégé to take [Britney] Spears's place. Lindsay Lohan said last week that she was "looking into" the mystical cult, and a source told In Touch, a celebrity weekly, that Madonna and Lohan have big plans. In taking Lohan under her wing, it would seem as though Madonna is trying to solidify her role as a kind of kabbalistic adviser and mentor. ...Madonna has arranged to do a duet with Lohan. The two are planning to take a "spiritual journey" together after Madonna's current tour. "They're going to visit the Holy Land," a source told In Touch. The Medad Residency is just to the left of the last caravan (the white rectangles), below the path that leads to the Ramat Shmuel Synagogue. If Qassams were landing every day and every night in Savyon, Ramat Aviv and Herzliya Pituah, I am not certain that Vice Premier Shimon Peres would have uttered that stupid phrase "Qassams-Shmassams." Peres, known for his preoccupation with defense issues, has never experienced battle. Throughout his career, he has never been under mortar and rocket fire. He lives in a bubble, like a Nobel Prize-winning scientist who has an algebraic formula that nobody understands - the essence of which is that one must not get hysterical, one must be steadfast. Theoretically, everyone agrees with it and admires his wisdom, certainly in Paris and in other world capitals. But when he demands that Sderot residents not panic, he proves just how cut off he is from the people. Preaching that people should not panic or get hysterical is justified, but the question is, why should Sderot have to play the role of a second Massada? Is it a military post or something? Is it an illegal settlement outpost? Is it in occupied territory? 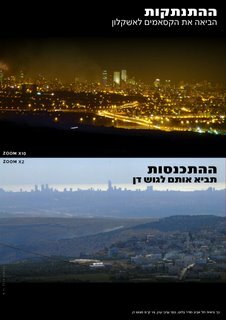 Not that I wouldn't have but I wouldn't have drawn an immoral parallel that it is okay to shoot at "settlements", even if it is but inferred. Well, his beard is not quite fully grown in and he doesn't have that special Lubaviych look but it seems it's an early edition of Matisyahu. In this footage Matisyahu appears with The Pey Daled Band. In the first clip Matisyahu and Pey Daled are performing at a "Unity Against Terror" concert held in Brighton Beach, Brooklyn, sponsored by the Jewish Legion and the Hatikva Jewish Identity Center, several weeks after 9/11. That concert was probably Matisyahu's biggest gig, until he was rediscovered in 93- 94. The second clip shows Matisyahu at a "Freedom For Pollard" concert in 2002, at The Ocean Avenue Jewish Center in Brooklyn, also co-sponsored by the Jewish Legion and the Hatikva Jewish Identity Center. Who would ever have believed that this talented singer was discovered by these two fringe activist Jewish organizations, years before Matisyahu hit it big. However the claim (*) made by Kach activist Yekutiel Ben-Yaakov is typicla Kahane-hype PR. And since I know Yekutiel (Mike for those in the know) a long time and knew Rav Meir even longer, trust me on this one. Matisyahu was playing because (a) he probably did it for free; (b) he needed exposure; (c) one of his friends invited him; (d) he craved positive attention. Or more. Yekutiel Ben Yakov, a leader in those groups, who organized the two events said, "We realized that Matisyahu was going to be a big star from the moment we saw him perform at our events." Ben Yakov, who also served as the co-founder of the outlawed Kahane Chai group added, "Our recognition of Matisyahu's musical talents (Lehavdel) is similar to our recognition of the Torah truth that Rabbi Kahane espoused. While one is Torah teachings and the other is musical, they are both spiritual discoveries. And what's with this "Lehavdel"? The Besht and the Berdichever never hallowed music and tunes? And BTW, if you're looking for credit, try the American High School in Israel program where Matisyahu studied in 1995. My cousin-in-law, Chaim Fischgrund adminsiters the school. 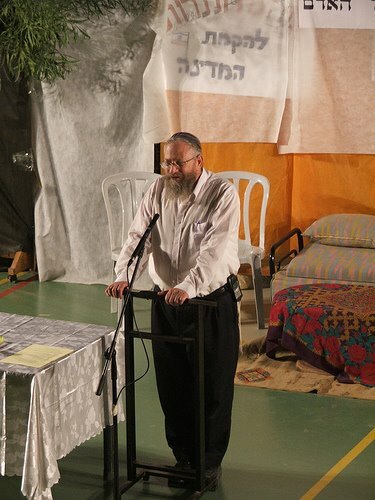 This is the Rabbi of Shiloh, Rav Elchanan Ben-Nun, also Rosh Yeshiva at Bet Orot. You can see more pics of the ceremony, including the nice-looking kids here. In a conversation with Wiesel at the Petra Nobel Laureates Conference, Olmert spoke of the Jewish love for the Land of Israel. "Shilo, Beit El, Ofra and Kedumim were always part of the historical Land of Israel, and they always emotionally will be. "We, Israelis, Jews, firmly and deeply believe that this Land of Israel from the Jordan River to the [Mediterranean] Sea has always been our heritage. We will always have a right to this land. Our history, and not that of the Palestinians, is buried underneath this land," the prime minister said. However, Olmert added, Israel would have to make a choice whether to continue living in places where Israelis would never be separated from the Palestinians and which would make the Israeli-Palestinian conflict "endless," or to live in "a part of this land" so that Israelis would be able to live "in partnership" with a contiguous Palestinian state. Settlers, Olmert added, would have to make a "personal choice" whether they wanted to live in a Jewish state or a Palestinian state. "The settlers can decide they would rather live on this particular piece of land, and that is [their] choice," Olmert said. A Reuters report covering the same event lacked that reference to my home. In fact, admittedly after a quick 10 minute search, I couldn't find any other reference to the statement above. Prime Minister Ehud Olmert surprised participants at a Nobel Prize winners conference in Petra on Thursday when he broached the possibility of Israeli settlers in the West Bank remaining in their homes under Palestinian sovereignty. "Each and every one of the settlers who live in territories that stand to be evacuated will need to decide whether to live in a Jewish state, the state of Israel, or in a Palestinian state," Olmert said. Olmert made his remarks in response to a question from Hebrew University Professor - and Nobel laureate in economics - Yisrael (Robert) Aumann, who asked the prime minister whether he intends "to expel tens of thousands of people from their homes" by way of the convergence plan, which he described as "a crime against humanity." What did Ariel Sharon say? Earlier, Sharon told the Jerusalem Post on September 15, 2004, "I don't see the possibility of Jews not living in Shiloh or Beit El, or not controlling Rachel's Tomb or living in Hebron." Critics on the Israeli Left say that, although Sharon has said that Israel must be willing to give ground on new settlements such as Shiloh and Bet El, the government is still allowing building work to go ahead. The final, most dramatic news came from Israel, where Prime Minister Ariel Sharon gave an interview to the liberal daily Haaretz in which he reluctantly held out the prospect of a withdrawal from the settlements if it would lead to peace. "We are talking about the cradle of the Jewish people," he said. "Our whole history is bound up with these places, Bethlehem, Shiloh, Beit El. And I know we will have to part with some of these places. I do not think we have to rule over another people and run their lives. I do not think that we have the strength for that." Ariel Sharon, the Israeli prime minister, gave his strongest indication yesterday that he expected to see a Palestinian state and was willing to evacuate controversial settlements to achieve peace. Apparently softening his stance, he declared that he was prepared for a "parting from places" that have been bound up with the state of Israel. "Eventually there will be a Palestinian state," he told the Israeli newspaper Ha'aretz. "I do not think that we have to rule over another people and run their lives. I do not think that we have the strength for that." Mr Sharon even named places in the "cradle of the Jewish people" that would have to be given up: the Palestinian town of Bethlehem and the West Bank settlements of Shiloh and Beit El. "I know that we will have to part with some of these places," he said. "There will be a parting from places that are connected to the whole course of our history. "As a Jew, this agonises me. I feel that the rational necessity to reach a settlement is overcoming my feelings." Well, we all know where Sharon is now. As you know, I'm a stickler for the right word or term. But in a short time it has become the center of the Jewish community here — and has begun to weave its way into this overwhelmingly Christian community. See how it easy it is? a. replacing "settler" with "revenant"
b. replacing "settlement" with "community"
c. replacing "refugee" with "internally displaced"
It seems that there are new guidelines that are reducing civilian deaths. Ah, but I am referring to how the U.S. is performing in Iraq, not how Israel is doing. An average of one Iraqi civilian every day was killed by coalition forces during 2005 in incidents at checkpoints or roadblocks or alongside convoys, according to statistics compiled by the United States military in Baghdad. But they are part of an effort initiated by Lt. Gen. Peter W. Chiarelli, the No. 2 American officer in Iraq, to find ways to carry out the military mission while minimizing brutal actions that wound or kill innocent Iraqis and anger and alienate the population. The actions of American troops have earned the outrage of the new Iraqi government as well. Earlier this month, Prime Minister Nuri Kamal al-Maliki lashed out at what he criticized as the "regular occurrence" of violence by American troops against Iraqi civilians. General Chiarelli earlier this year described plans to delay firing warning shots by requiring signs, hand signals, strobe lights and even lasers to make sure civilian drivers approaching checkpoints can see the Americans clearly, especially at night. Now, if only Israel could be so blase. But What About the Real "Hearts that Bleed"? Haim Watzman is the author of "Company C: An American's Life as a Citizen-Soldier in Israel" and what we used to call a "bleeding-heart liberal". Very few Israelis are overjoyed at the deaths of civilians, although to say that perhaps some of the dead don't support terrorism or even contribute actively to it is a matter I am unqualified to pass judgment simply because I don't really know. Anyway, the New York Times hosts him today. His op-ed piece is entitled: Hiding Behind the Enemy and the link for the full text (for those who can get it is here). The army of a democracy fighting an insurgency — Israel in the West Bank, like the United States in Iraq — faces tough choices. Its government requires it to observe rules of war intended to protect the rights and lives of civilians. At the same time, commanders must protect their soldiers. The two imperatives often conflict. But morality in combat is not just an abstract principle. It is an element of an army's strength. It is also essential to the society that sends the army into battle. If the safety of soldiers becomes the standard according to which an army designs its missions, the army will not have the courage to take risks. An army that does not take risks will be easily beaten by an opponent that does. So it's not unreasonable — in fact, it's essential — for a society to demand that its army observe moral standards, even if the price to be paid is that more soldiers will be killed. Laws and moral rules are another set of constraints. Soldiers sometimes chafe at them because, unlike hills and bullets, they seem like artificial and unnecessary barriers. In a purely military sense, armies could better do their jobs if they could ignore the civilians on the battlefield. But we don't allow them to ignore civilians. And truth be told, I've never met a soldier who thinks armies ought to be able to maim and kill civilians with impunity. But in the final analysis, Israel and its soldiers will not be less secure. They will occupy the high ground, and that is the most secure place to be. You'll notice that the subject has nothing really to do with what Israel is now doing and refers to the practice of "human shield" and bulldozing. Nevertheless, the issue of Gaza is "present" and this article doesn't help because it doesn't point to the responsibility of Arab leaders to do away with the terror. And it doesn't highlight the evil of the Arab terror enough. This op-ed "lent" itself to a bad goal: slammering Israel. (slammering = slamming + hammering). "I promise you, my little girl, that this will be the very last bombardment, okay Dana?" This is a take off of a very famous Yom Kippur War song popularizwed by Yehoram Gaon the refrain of which goes: "I promise you my little girl, this will be the very last war". Jabotinsky's book, The Five, in an English translation is reviewed in The Nation by Jacqueline Rose. The end of The Five suggests that the question of how to respond to suffering was something Jabotinsky was never able to answer. It is as if the only options he could imagine were impotent, humiliating self-sacrifice or militant, invincible rage. But unless this deadlock can be broken, with all its dire consequences for Palestinian Arabs and Israel as a nation, the conflict in the Middle East has no chance of being resolved. To recall, finally, Weizmann's letter to Jabotinsky of 1915, in which Weizmann asked him how he could bear to be so hated: Jabotinsky seems to have thrived on such hatred, risen to it, as we might say. The Five tells the other story. It allows us to watch his love traveling elsewhere--back to Odessa, in a last fleeting gesture to a world that he helped put the seal on for all time. In Jabotinsky's writing, Zionism both affirms and doubts itself. What would Israel look like today if the modern leaders who have claimed to take their inspiration from him--Begin, Netanyahu, Sharon and now Olmert, who referred to Jabotinsky in his speech to the first session of the new Knesset at the beginning of May--had shown themselves capable of such radical self-questioning? For Jabotinsky Arab national aspirations, like those of the Zionists, were legitimate. Hence his acknowledgment of the inevitable violence of the struggle. Antagonism between Jew and Arab therefore veiled a latent identification. 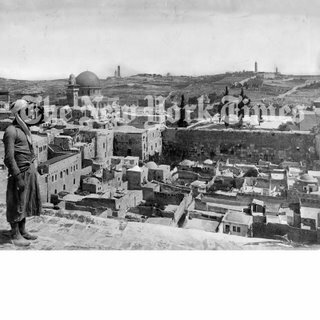 Unlike those Zionists who blithely predicted, with a barely concealed racism, that the Arabs would relinquish their land when they saw how the Jewish pioneers made the desert bloom, he insisted that they were a people of dignity who would not be bought: "The entire country is full of Arab memories." National groupings cannot, therefore, but be at war with each other. In The War and the Jew, he makes a key distinction between the "Anti-Semitism of Men," based on irrational, visceral hatred ("a subjective repulsion, strong enough and permanent enough to become anything from a hobby to a religion," "a constant urge to harm the hated race"), and the "Anti-Semitism of Things" ("steady, constant and immutable, and therefore much more formidable"), which follows from the natural desire to protect, and foster, the interests of one's own kind: "an instinct which cannot be criticized because, after all, it is as natural as preferring one's own children to one's neighbor's offspring." Zionist and Arab therefore share a natural hostility to each other. Once again the fiction tells another story. "It is a good thing that you should live for a time among the Philistines," Samson says to one of his followers. "They are our neighbors, and if men come to know each other, there is no more enmity between them." In Jabotinsky's future, Arab and Jew would not be neighbors so much as carefully differentiated groupings within the body politic of the new state. We are a far cry from The Five's "good-natured fraternization of nationalities," the "Babylonian diversity of our common forum" in which the narrator took such naïve but wholesome delight. Arabs might be citizens, they might even participate in government (once they had submitted, there could even be an Arab vice president), but only the Jews would fully belong to the nation. Behind the apparently liberal demand for Arab minority rights lies a plea for the separation of peoples. 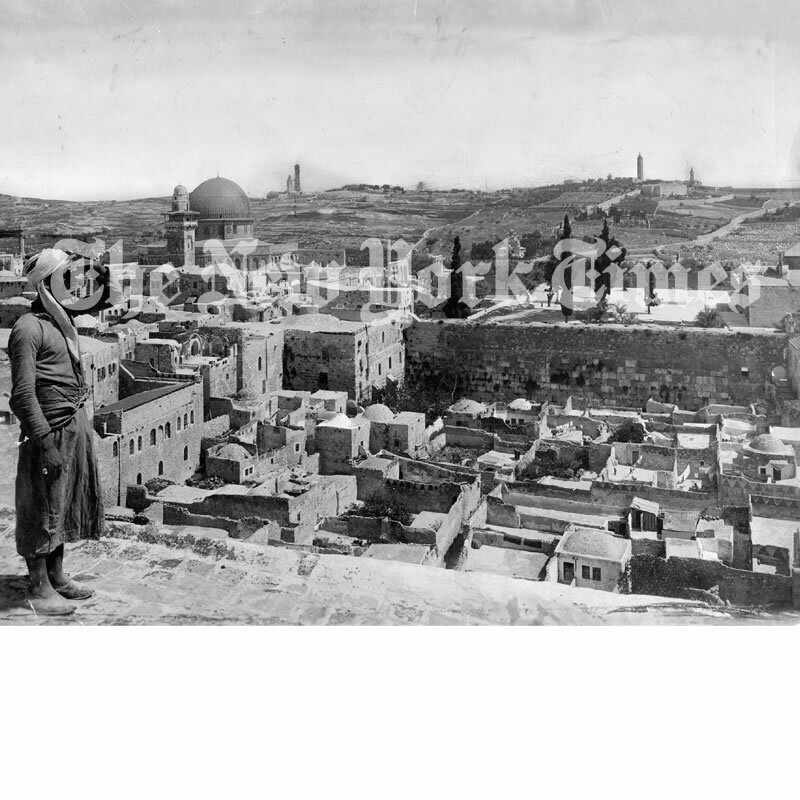 Jabotinsky has transposed to Palestine the exact arrangement whose utter nonviability for the Jews he knew only too well: "every possible right that the Jews...had never achieved in other countries." "The Helsingfors utopia has, of course, never been attained either in Russia or anywhere else," he wrote in his 1930 essay "Binational Palestine." "I trust that the first country where they will, some day, be fully applied will be our own Palestine--that is, when we Jews shall have become its masters." If there is an affinity between Arab and Jew, such a form of recognition shows its darker side. The line from Odessa to Tel Aviv, from failed assimilation to national identity, can be run more ways than one. For if there can only be one sovereign people, why would the Arabs, any more than the Jews in Russia, want to stay? Slowly, as Jewish emigration to Palestine from Europe increased throughout the 1930s, Jabotinsky's vision turned toward the transfer of peoples. Not forcibly--he was outspoken against forcible transfer--but nonetheless as the consequence, ironically, of his own belief in Arab nationhood. As Shavit points out, there was an inherent contradiction in the official Revisionist position, which rejected the idea of a pan-Arab nation while maintaining that the Palestinian Arabs could be effortlessly absorbed into the larger Arab world (a contradiction all the more intense in that they refused to recognize the Hashemite regime in Transjordan, and hence the Transjordanian nation that was meant to receive them). Somewhat at odds with his own movement, Jabotinsky had no such problem with the larger pan-Arab vision--and, if there was a greater Arab nation, why should they not leave? According to Edward Norman, recording a conversation about a possible transfer of Palestinian Arabs to Iraq, Jabotinsky made the truly "original suggestion" that it would be wise to have the Zionist Organization openly oppose Arab emigration from Palestine, and then the Arabs would be sure the scheme was not Jewish and that the Jews wanted them to stay in Palestine only to exploit them, and they would want very much to go away to Iraq. But Is He a "Settler"? Exactly Who is The Amateur? Hey, You 'Krauts', She's Jewish!